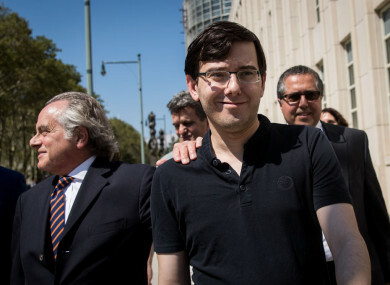 Shkreli must also forfeit his one-of-a-kind Wu-Tang Clan album. US MAN MARTIN Shkreli, the self-dubbed “pharma bro”, has been ordered to forfeit more than $7.3 million (€6 million) in assets – including his copy of a one-of-a-kind Wu-Tang Clan album – as part of his punishment for securities fraud. US District Court Judge Kiyo Matsumoto made the ruling against the jailed Shkreli, who is due to be face sentencing for his conviction on charges that he cheated wealthy investors in two hedge funds he was managing. The former pharmaceuticals company CEO was convicted in August of cheating investors in two failed hedge funds. He remains in jail and faces up to 20 years in prison when he is sentenced on 9 March. Shkreli, 34, came to prominence for boosting the price of life-saving drug, daraprim, which is used to treat patients with HIV. He was out on bail during his trial but was jailed when the judge decided he had made veiled online threats against Democrat Hillary Clinton. Along with the Wu-Tang Clan Once Upon a Time in Shaolin album that Shkreli has boasted he bought for $2 million, he would have to give up $5 million in cash in a brokerage account. He also would be forced to forfeit other valuables including a Picasso painting and another unreleased recording that he claims he owns, Tha Carter V by Lil Wayne. In a letter last week asking for leniency, Shkreli admitted to the judge that he was “very far from blameless” in the case. “I was wrong, I was a fool. I should have known better,” Shkreli wrote in his letter to Judge Matsumoto. I accept the fact that I made serious mistakes, but I still believe that I am a good person with much potential. His defence is seeking a maximum of no more than 18 months behind bars. Email “'Bad boy of pharma' Martin Shkreli ordered to forfeit €6 million in fraud case”. Feedback on “'Bad boy of pharma' Martin Shkreli ordered to forfeit €6 million in fraud case”.